"Susie Glaze is a fresh young voice, strong and flexible…And, she's a communicator, to me the most important of qualities in a singer…how wonderful to hear this new voice taking up my songs… quite suddenly I know that, with people like this to trust, my music will go on living, and soaring. 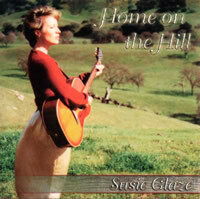 "Don't let the gentle spoken voice of Susie Glaze at the beginning of this CD fool you. After "One More Mile" and "Wichita", you might want to make sure your barn's not burning. Susie does that. She will glide from a plaintive moan to a cozy vibrato and every choice she makes seems perfect. Every song is a journey and her versatility as a vocal stylist is impressive and downright unbelievable at times. The musicians embrace her and dance with her. Their excellent playing and harmonies embellish and propel her but never overwhelm her. Susie's choice to interpret Lucinda Williams, Gillian Welch and Jean Ritchie is bold, but, by God, Susie stakes a claim and makes those songs her own. My favorite cut is "Paper Wings". That song should be on the radio. I just hit the repeat button." "From your mouth through my ears to my soul I absolutely love your new CD. The song selection is a seamless musical blend of the past and the present handled with eloquence and grace. Your voice is phenomenal and the instrumentation is tight, skillful, and beautifully arranged and performed. Your music is truly a healing experience for those who will hear. May they be many. Thank you for creating such a beautiful album." "Susie Glaze's CD debut is a stunner. She's been quietly making a name for herself in southern California, and with this CD, a much wider audience can discover her breath-taking talents. Backed by the Eight-Hand String Band, she possesses one of the most distinctive and hauntingly evocative voices out there today. She emotionally hooks you from the first moments of the first song, and doesn't let go. This collection mixes originals and classics, but she makes every one of them her own. The production is superb, ranging from mariachi to stark simplicity. Besides an extraordinary voice, what sets Susie Glaze apart is that she sings straight from the heart, with passion, sadness, and yearning. Unlike the slick, market-tested, pre-chewed, musical pablum that predominates these days, this CD will haunt you long after it's over." "She has the gift of telling a story through music with a voice as clear and fresh as a spring morning."